Previous studies suggested that insurance coverage and SES can affect outcomes in various types of lymphoma. 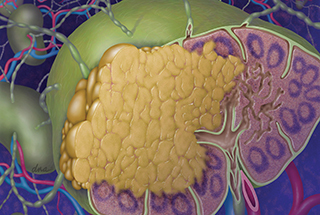 Patients with follicular lymphoma (FL) who have private insurance are more likely to have improved overall survival (OS) compared with those with no insurance or are covered by public insurance plans, according to a study published in Blood. Although innovative treatments such as immunotherapy have improved outcomes for patients with FL, management is marked by significant heterogeneity and may be influenced by a patients’ insurance status. Previous studies have suggested that social factors, such as socioeconomic status (SES) and insurance coverage, may negatively impact outcomes in various types of lymphoma, but the impact on follicular lymphoma has not been adequately explored. For this study, researchers accessed the outcomes data of 43,648 patients with FL diagnosed between 2004 and 2014 from the National Cancer Database. Various demographic and clinical data, including race/ethnicity, age, SES, disease stage, and comorbidity were collected. Patients were grouped according to insurance status: private insurance, no insurance, Medicaid, and Medicare. Overall, 47%, 3%, 4%, and 46% of patients had private insurance, no insurance, Medicaid, and Medicare, respectively. The median follow-up was 57.9 months among patients younger than 65. The 3-, 5-, and 7-year OS rates were 92%, 88%, and 84%, respectively. Results showed that younger patients with private insurance had significantly improved OS rates compared with the other groups, with 5-year OS rates of 90% among patients with private insurance, 78% with Medicare, 80% with Medicaid, and 78% without insurance. After median follow-up of 42.8 months, among patients with FL aged 65 and older, the 3-, 5-, and 7-year OS rates were 73%, 63%, and 52%, respectively. Among these patients, only patients with Medicare had worse OS outcomes compared with those who were privately insured.